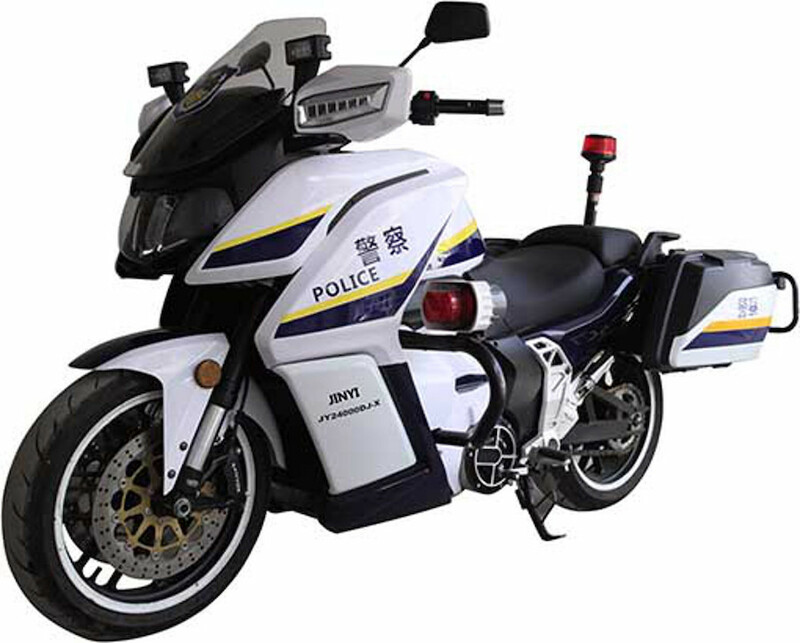 Last month we revealed the first image of Chinese firm Zongshen’s entry into a state-run tender to supply police and army units with an electric bike. Now we’ve seen another contender, and it has three times the power of the Zongshen proposal. Where Zongshen uses an 8kW electric motor mounted inside the rear hub, the new proposal – from Jinyi – features a 24kW motor. As usual with electric bikes, the rated power is a continuous figure, representing the amount it can put out for an indefinite period without overheating. The Jinyi’s peak power, available for shorter bursts and more comparable with petrol-engine power figures, is put at 40kW. It is allied to 65Nm of torque. The bike’s weight is some 315kg in full police spec, but drops to around 245kg with the cop kit removed. That’s not far from the sort of figure we’d expect from a fully-fuelled tourer in this size bracket. The electric power comes from a 118.4V, 10.6kWh lithium battery pack, which is mounted in a conventional chassis using cast aluminium sections around the swingarm pivot and steel elsewhere.